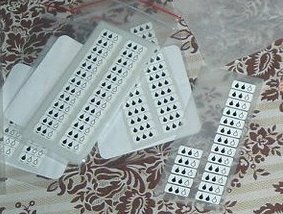 We have created a system to show absorbency of AIO pads, using iron-on labels (I purchase mine as a special order). Using 1 drop to represent light flow, 2 drops to represent medium flow and 3 drops to represent heavy flow. 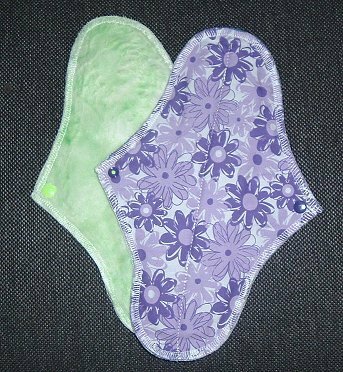 This way the recipient can work out what absorbencies the pads have, as well as knowing that the label side goes against the underpants. We also created an instruction sheet, giving information in picture form of how to wear and wash AIO pads, with our drop system of absorbency. This is useful for areas where instructions given in English may not be understood. The instruction sheet can be downloaded from our instructions page. You could easily edit the image in a graphics program to remove the label if your AIO pads will not include this. I find the best way to do the core is to cut the core fabric into a rectangle with curved ends, then sew that to a full (winged) layer of flannelette with a large zigzag stitch. This picture shows sewing a 2 layer hemp fleece core to a layer of blue flannel/flannelette. This blue layer will be hidden in the pad, but provides extra stability and absorbency through the pad, and also means the hemp core can be sewn on and you won’t see the stitching, so it won’t matter if it’s not exactly even or neat looking. Of course you can just sew the core to the top layer of fabric, but this hidden core method is one way to do it quickly, and if you are not confident you could neatly sew the core on keeping it in the centre, then this way is definitely neater. Then the way you make the pad depends on the method you are using. 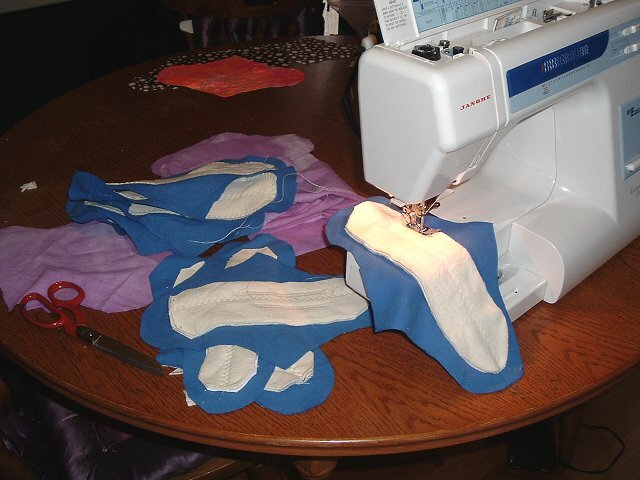 This is where the pad is made, then “turned” out the right way and a line of stiching done around the outside edge. To make one of these, lay the backing fabric down first (good side up) and the toping fabric down (good side down), with your flannelette layer with the core sewn to it on top. Then sew around the edges, leaving a gap that you can turn the pad through. Make sure it’s all turned out properly, then do a line of stitching around the top to finish it off, sewing the opening closed. This is where the pad is made by simply placing all the layers down in the order they need to be (backing, core, top), then using an overlocker/serger machine or the zigzag setting of your sewing machine to sew around the edges of the pad, sewing it all together. 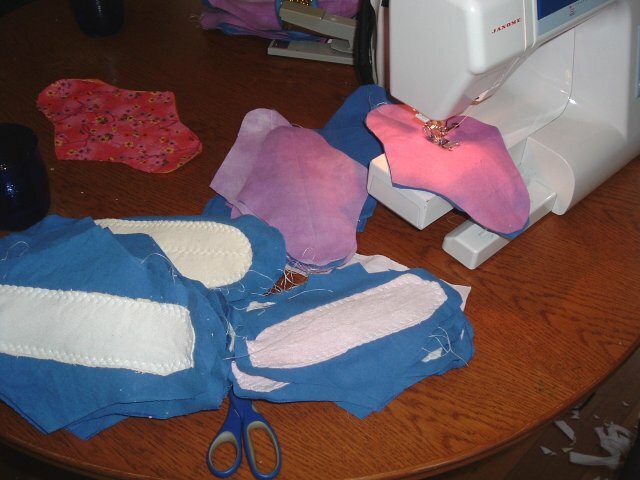 If you are able to make pads this way it is a lot quicker.